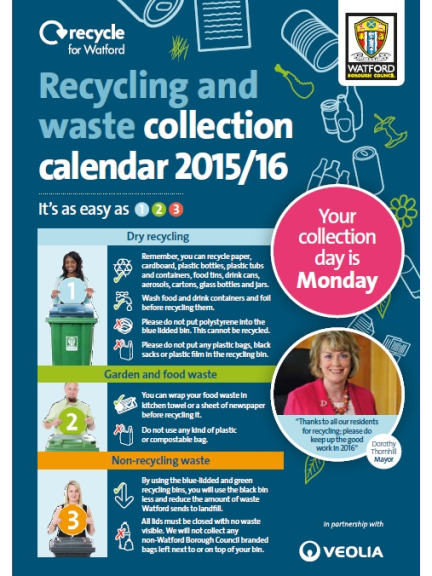 Have you received your new waste and recycling calendar for 2015/16 yet? In it you will find information on Watford's kerbside recycling scheme, as well as vital information on Christmas collection dates and any changes to your collection due to bank holidays. However, plastic bags cannot be placed in your blue recycling bin. You can put them in your black bin, take them back to a supermarket to be recycled, or, now that we're all being charged 5p per plastic bag, stuff a few in your handbag or car boot and save a few pennies when out shopping! You can also recycle food and garden waste in your green bins. Please use newspaper or kitchen towels to wrap your food waste rather than compostable liners because... wait for it... compostable liners can't actually be composted! Please click here for more information about Watford's waste and recycling collection service. And if you need to request a collection calendar, you can call the Veolia Watford Contact Centre on 020 3567 6900 or send an email. You can also download a copy by clicking 'useful downloads' to the right of this page.